Here at Teach Mentor Texts we are always looking for more ways to support teachers! We've found that teachers seem to be constantly on the lookout for great nonfiction. We know we are! To help with this undying quest for outstanding non-fiction, we are excited to participate in Nonfiction Picture Book Wednesday hosted by Kid Lit Frenzy and The Nonfiction Detectives. Every Wednesday, you'll find a non-fiction review here - although it may not always be a picture book review. Please visit Kid Lit Frenzy and The Nonfiction Detectives to see what non-fiction others have to share, too. GoodReads Summary: There are more than 200 species of primates in the world. Going Ape! is a wonderful introduction to some of the most fascinating ones for children just discovering the world of animals. From Japan’s macaques to Africa’s gorillas, brilliant images and brief, informative text will capture the imagination of young children. What I Think: The cover of this book really caught my eye. It turned out to be a great read for both my 2-year-old and my 5-year-old. Little Bean liked to look at the pictures and when I told him the name of that particular ape, he loved repeating the foreign words (well, foreign to him...). Peanut liked listening to the facts about the apes. We were able to make lots of connections with apes we had seen in other books, on TV or in movies, or at the zoo. It was a great opportunity for him to make those connections and to maybe learn a few new things about these animals. What I loved as a parent, was that the text is simple. Some expository texts are so jam-packed with facts and vocabulary and non-fiction text features - and all of that is great - but it was refreshing to read a simple book with artwork that was appealing. It was nice to not have to navigate the non-fiction text and jump around and try to explain things at a more basic level for both of my kids. 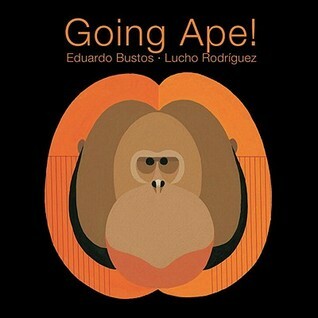 This book was perfect for us and I can see how it would be a simple book that could ladder with more in-depth non-fiction as kids get older or as a discussion about apes progresses. I really enjoyed the simplicity of this book! Both text and illustrations were simple yet effective. Writing Prompts: Write about another time in your life when you encountered an ape - maybe it was on TV or in a movie, on a visit to the zoo, or in another book.